Spun-off from the Kanegafuchi Spinning Co., Ltd. in 1949, Kaneka Corporation' s initial main products were caustic soda, soap, cosmetics, edible oils, and electrical wires. Later the company diversified into polymers, fermentation, biotechnology, and electronics. Its business activities now span a broad spectrum of markets - from plastics, EPS resins, chemicals, and foodstuffs to pharmaceuticals, medical devices, electrical and electronic materials, and synthetic fibers. The company has been a leader among Japanese chemical companies in establishing overseas operations, beginning in 1970 with a subsidiary in Belgium and progressing to the establishment of operations in the United States, Singapore, Malaysia, China, Australia, and Vietnam. Kaneka Corporation is set on both staying globally competitive and protecting the environment, a stance that is consistent with its corporate philosophy. This states: "With people and technology growing together into creative fusion, we will break fresh ground for the future and tie in to explore New Values. We are also committed to challenge the environmental issues of our planet and contribute to upgrade the quality of life." Specific initiatives undertaken by Kaneka Corporation include the reduction of energy consumption, complying with global environmental standards, reducing industrial waste, and reducing risk through the development of various production technologies. In the midst of a global economic downturn precipitated by events such as the bankruptcy of Lehman Brothers, Kaneka Corporation is accelerating its efforts to reduce its operating costs. As the company's Takasago Plant is a large consumer of energy, it currently is engaged in an "Advance 17" initiative to slash its energy costs. Almost all the fuel and electricity consumed by the Takasago Plant is for its boiler, steam turbine, and generator (BTG) facility. With the rising price of crude oil, Kaneka Corporation has urgently needed to implement countermeasures that would reduce this facility's energy costs. And in keeping with its corporate philosophy, the company is intent on reducing its CO2 emissions. A further aim of the company is the improvement of efficiency and reduction of labor costs. The BTG facility has two boilers and four sets of steam turbines and generators, and this equipment all varies in energy efficiency. In addition, the price of electricity fluctuates depending on the season and the time of day. The operation and maintenance of all this equipment has to be balanced in such a way that cost is minimized and the steam and electricity requirements of the Takasago Plant are fully met. Before this project, the BTG facility's operators were kept busy around the clock monitoring all process values in real time and manually adjusting to load changes. 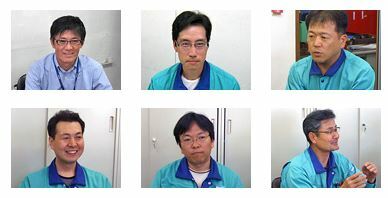 Because the facility had a variety of operation patterns, each of which required different procedures for minimizing costs, operators were required to have very high level skills and their work was very stressful. 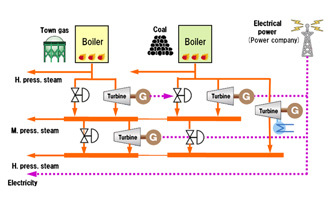 The engineers at the Takasago Plant had reached the limit of what they could accomplish through hardware modifications, PID control, and sequence control strategy to improve energy efficiency at the BTG facility. 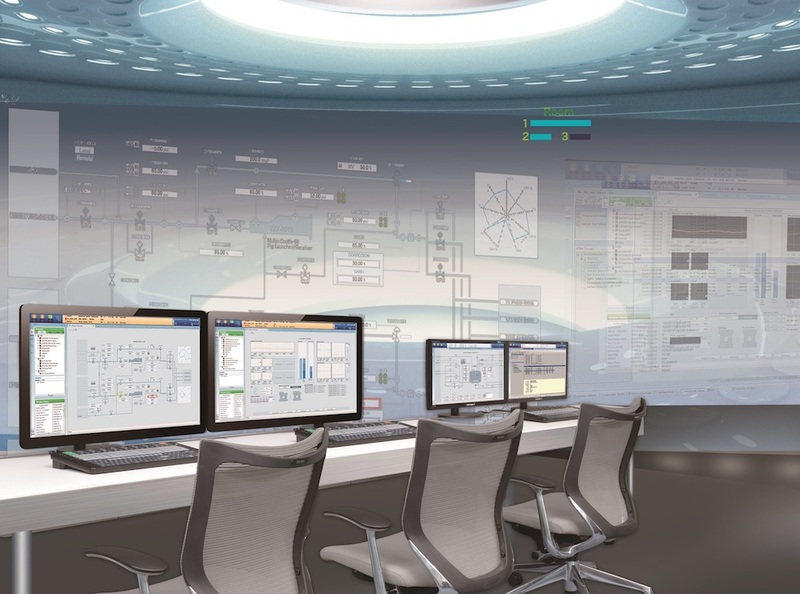 After considering the use of an operational support package and a PIMS, they turned to Yokogawa for an advanced process control (APC) solution that could be fully integrated with their existing control strategy. Although the plant's engineers fully understood the benefits that an APC solution could have in automating the BTG facility's operations, they were also well aware of their plant's complexities and knew that they would need an experienced partner that could help them apply this technology and derive its full benefits. They knew that with Yokogawa, which has a long track record in implementing over 400 APC solutions worldwide in a wide variety of process industries, they would have a tried, tested, and proven partner. 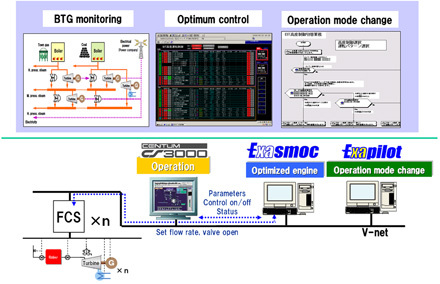 Working closely with their counterparts at the Takasago Plant, the Yokogawa team assembled for this project installed and integrated the Exasmoc multivariable predictive controller and the Exapilot operation efficiency improvement package with the monitoring, control, and operation functions of the plant's CENTUM CS 3000 DCS. The Exasmoc APC controller uses models to optimize plant behavior by computing sequences of variable adjustments. This has made it possible, for example, to rapidly adjust set points when boilers and turbines are started up or shut down. The Exapilot package enables the automation of operational sequences such as plant start-up, shutdown, and product switchover by storing system procedures based on the expertise of experienced plant operators. Through the integration of the CENTUM CS 3000 DCS with the Exapilot operational support and Exasmoc APC solutions, the BTG facility's operations could be fully automated, significantly reducing operator workload and achieving an 85% reduction in alarm situations. The plant can now be operated much more smoothly and flexibly. Operational efficiency is up, energy costs have been reduced 0.21%, and CO2 emissions are down 1,000 tons annually. The achieved improvements are exactly on target. Further improvements in energy efficiency are foreseen in the immediate future at the Takasago Plant. Efforts to secure additional improvements at this plant are ongoing, and range from the improvement of stability at low loads, optimization of control strategy based on alarm analysis, and the reduction of changeover times when the plant switches from daytime to nighttime operation.